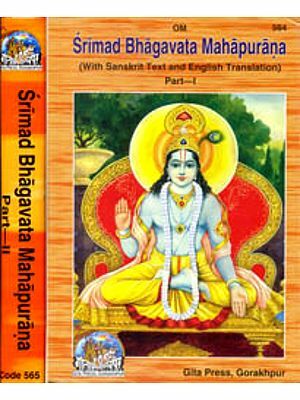 To compare Srimad Bhagavad Gita and Srimad Bhagavata Purana is a great task, since the author is required to study a large number of books, both original and commentaries. Besides, the complexity and subtleties of thought, which one has to master, are so numerous that one would require total dedication and highly developed critical intelligence. Dr. Urmi's work gives full evidence of a highly cultivated mind, dedicated heart and disciplined spiritual insight. The book has dealt with all the important issues relevant not only to Karma Yoga, Jnana Yoga and Bhakti Yoga but also to Dhyana Yoga and Samkhya Yoga. It has also thrown light on the doctrine of Divine Incarnation and that of Vibhuti. There are certain issues, which are to be found only in the Srimad Bhagavata Purana and not in the Bhagavad Gita - some of these also have been referred to. The problems of eschatology have also been adequately covered. Certain minor topics relating to the doctrine of Maya and authority of the Veda have also been adequately covered. Certain minor topics relating to the doctrine of Maya and authority of the Veda have also been commented upon. Dr. Urmi's comparative study of the style and approach of the Bhagavad Gita and Srimad Bhagavata Purana brings out her understanding of Indian poetics. She rightly points out that Srimad Bhagavad Gita and Srimad Bhagavata Purana are essentially monistic in nature, although she takes great care to explain that this monism has unique features in so far as it accepts and reconciles both the Nirguna and Saguna aspects of Brahma. She is educated in the Bombay University. She stood first at both B. A. and M. A. examinations and obtained more than a dozen medals, prizes and scholarships. She received the degree of Ph. D. from the Gujarat University. At present, she is working as a lecturer in the Sanskrit Department of St. Xavier's College, Ahmedabad (Gujarat, India). She has two books to her credit in Gujarati: Mahakavi Bhasa published by Sanskrit Seva Samiti, Ahmedabad and Srimad Bhagavata Purana published by Sanskrit Sahitya Akademi, Gujarat State. She is also the co-editor of the Swapnavasavadattam of Bhasa, Vikramorvarsiyam of Kalidasa in English and Adi Sankaracarya (Twelfth Centenary Commemoration Volume) in Gujarati. Kalidasa's Malavikagnimiram edited by her in English is in the press. Dr. Urmi has attended several inter-national and national conferences and participated in state-level seminars. She has presented research papers in these almost all of which are printed or are accepted for publication in the reputed journals of Indology. At present, she is working on the Minor Research Project granted by the UGC on "A Study of the Philosophy of Dhanurveda and its Application to the Shooting Sport in the Modern Scenario. Although a number of commentaries and treatises have been written on Srimad Bhagavad Gita and Srimad Bhagavata Purana, the work of Dr. Urmi has certain special features, which makes it both unique and refreshing. An important aspect of Dr. Urmi's work is related to the concept of the Ultimate Reality. It has been rightly said that Srimad Bhagavad Gita provides quintessence of the Vedic and the Upanishadic views of Reality. This view is extremely subtle, and it is only when one has mastered some of the most difficult concepts such as those of Brahman, Atman, Purusa, Iswara as also of Aksara Purusa, Ksara Purusa and Purusottama that one an write so effortlessly and so lucidly as Dr. Urmi has done in this book. She rightly points out that Srimad Bhagavad Gita and Srimad Bhagavata Purana are essentially monistic in nature, although she takes great care to explain that this monism has unique features in so far as it accepts and reconciles both the Nirguna and Saguna aspects of Brahman. In the discussion regarding Samkhya philosophy, she has taken great care to show how Bhagavad Gita's Samkhya is quite distinguished from the Samkhya of Iswarakrsna. She has, however, brought out quite clearly how Sesevara Samkhya has been adopted by Srimad Bhagavad Purana. These are three great secrets of the teaching of Srimad Bhagavad Gita. The first secret, guhya rahasyam, relates to the relationship between Purusa and Prakrti and the method by which one can be liberated from subjection to Prakrti. The second secret, guhyataram rahasyam, is related to the doctrine of two Prakrtis, Apara Prakrti and Para Prakrti, the doctrine of triple Purusa-Ksara, Aksara and Uttama, and the unique position of Jiva, which has relationship directly with Para Prakrti (para prakrtirjivabhuta) and with the Supreme Lord (mama-eva ansah). And the third secret, guhyatamam rahasyam, is related to the message of unconditional surrender that transcends all Dharmas. These three secrets, combined together, provide the widest possible basis for the synthesis of Karmayoga, Jnanayoga and Bhaktiyoga, a synthesis which enables the seeker not only to attain Nirvana but also to continue to do the divine works in the world for Loka-sangraha (solidarity of humanity), coupled with the crowning realisation of the most mysterious love and devotion for the Divine, the theme which receives unique treatment in Srimad Bhagavata Purana. As one reads the 11th Skandha of Srimad Bhagavata Purana, one cannot fail to arrive at that deep devotion for Sri Krsna, which would only end in the unconditional surrender to Him. Srimad Bhagavad Gita can then be felt as melting itself into Srimad Bhagavata Purana. All this and then be felt as melting itself into Srimad Bhagavata. The relevance of the teachings of Srimad Bhagavad Gita to our own times is undeniable, particularly when we find that any representative member of modern humanity is passing through the same crisis through which Arjuna passed when he stood in the battlefield and got bewildered by the conflict of emotions, conflict of duties and conflict of the lower and higher aspects of personality. The vast and synthetic philosophy and vision that Sri Krsna provided to Arjuna at that critical hour is also the philosophy and vision that we need for our deliverance from our own inner conflicts. But more than that, what is most appealing to the contemporary humanity is Gita's insistence on the reconciliation of utter freedom from action and deep involvement in action. Not in the caves or on the tops of mountains is our field of life but right here in the midst of battle of life - this is the message of the Gita. This message of the Gita is of great significance as far as contemporary humanity is concerned. It is this which makes a fresh study like Dr. Urmi's so important. And, indeed, the study of Srimad Bhagavad Gita will always provide a most potent stimulus for the study of Srimad Bhagavata Purana. I should, therefore, like to congratulate Dr. Urmi for having undertaken in this book a comparative study of Srimad Bhagavad Gita and Srimad Bhagavata Purana and for having given to the readers fresh insights into these great works, which have greatly influenced the development of Indian culture. I am sure that this book will be welcomed widely not only in our country but also in other parts of the world, where interest in Indian studies is gradually increasing. The Vedas, the Upanisads, the Mahabharata and the Ramayana are the texts related to the very roots of the Indian culture, irrespective of the religion, creed or race of the people; for, they reflect man as he is, what he aspires to be and what he should ideally become. Among these too, the BC can be called the very soul of an Indian - nay, of the entire humanity. A study of the BC unfailingly draws one to it as being the' 'Gospel of life". This Song Celestial (as Arnold calls it) is the exposition of the practical philosophy of life given by the Lord Himself to Arjuna at the outset of the Mahabharata war (thus it stands almost at the climax of the Epic story covering the chapters 25-42 of the Bhisma-parve). It aims at removing Arjuna's moha by presenting its characteristic version of the philosophy from the Upanisads. A few concepts picked up from the Vedic literature are being developed in the BC for the first time, and some original concepts are added to them. In doing so comes to the surface the exquisite synthesizing skill of its author. He has depicted here two new outlooks of life and their fulfilment, namely, Karma and Bhakti, along with the already established one of Jnana. This unique synthesis, namely, the BC, with its widest and deepest possible vision, holds a universal charm and appeal. Primarily to an Indian, then to a Hindu and to a Vai$1Java, the SBP gradually came to hold a unique significance. Its author being the same as that of the BC, i.e. Veda Vyasa, the SBP despite being a cult-oriented (i.e. 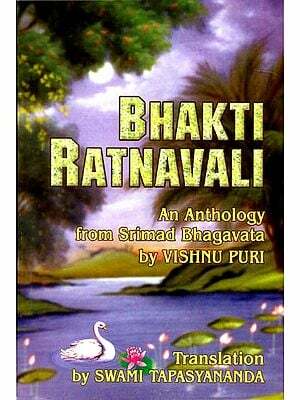 Vaisnava) text, also contains deep spiritual speculations with a strong undercurrent of Bhakti. The general impression that the SBP is an exposition of mere devotion is negated by even a single reading of the entire text, especially of the Eleventh Skandha. On reading the latter, an alert mind is instantly reminded of the BC and starts making comparisons between the two. The tenth Skandha traditionally believed to be the heart of the Lord describes His life and deeds, while the Eleventh Skandha is considered to be His head, as it contains Krsna 's final message (to Uddhava). Being so, it aims at bestowing Moksa, and thus Vairagya or Renunciation is added to the Jnana, Karma and Bhakti of the BC. Consequently, despite the fact that both the BC and the SBP are the direct teachings of Krsna, the latter is influenced by the former, and yet has its distinct contribution to the BC's teachings. Hence the SBP can be termed as the bhasya commentary on the BC. The book, therefore, refers to the similarities as well as the differences between the BC and the Eleventh Skandha of the SBP. The BC is referred to with priority due to its chronological antiquity.